The Venice Basketball League was born in 2006 as a community tournament on the legendary courts of venice beach, the VBL is a global force for basketball culture. Los Angeles provided the necessary playground for the Venice Basketball League to build into its identity as not only a place for basketball players to compete, but a haven for them to be acknowledged, heard, and seen. As founder Nick Ansom can reference, there’s a special feeling when you’re on a court you call home surrounded by people you call family. It’s a feeling the VBL has inherited at it’s core, serving as a platform for a global unity, and a family that started in Venice, CA. Realizing that this family should include everyone, VBL uses itself as a tool to allow all proceeds from the clothing line to fund the hand delivery of basketballs to children located in less developed areas as well as shantytowns where they’ve built and rebuilt courts for others to call home. However, with competition at the core of basketball, no one can forget the energy and excitement of a good streetball game. 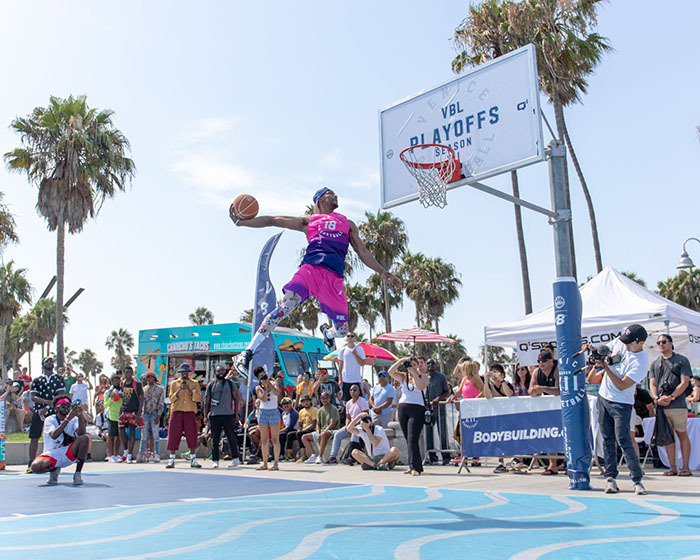 Each summer the Venice Beach courts are filled with vibrancy as you hear hilarious commentary from the local MC’s and see some of the most unworldly dunks known to man. This is one of the only places in the city where there’s nothing that can speak for you, only the game can speak for itself. It’s an idea that VBL believes unites people from all walks of life, once you step on the court, there’s no room for judgement with quick passes and a dunk or two if you’re not paying attention. It’s the competition that brings the energy, and the soul of the players that keeps the game going. Lastly, to bring the VBL full circle, the Kids Venice Basketball League (KVBL) was formed in 2008. In hopes to elevate the youth, the KVBL allows children from all walks of life to engage with this community effort. It’s served as a holistic platform for children where they are thought basics of nutrition, yoga and surfing and also get help for university scholarships, connections and more. Aside from elevating adults from street ballers to NBA stars, globetrotters, and overseas titans, the kids league understands that to change this world, you have to focus on the children. The KVBL knows it’s talent and hopes that they always can unite, showcase, and inspire others from the hard work and hours of practice each legend put into their game. In partnership with “Project Backboard” VBL’s initiatives also helped rebuild a dozen courts around the world, just last week Nick was in the Philippines and was able to inaugurate the “Jungle Dome” it’s latest sister court! As every great basketball player began the same way, it’s no different on the west coast of sunny LA. What you bring is what you get, and let me tell you, we bring it all. 11:00 am – 11:30 am Ninja Turtle nutrition book read with Greg Cipes and yoga class. 11:30 am – 12:00 pm Dunk showcase, challenges with kids/teens, prize giveaways. 12:00 pm – 1:00 pm Fan interaction, games, engagement and challenges. 1:00 pm – 1:30 pm Brandon Armstrong appearance and fan interaction.